The Remote Control Settings window features Web Browser (Phone) and Web Browser (Tablet) presets. Once a preset is loaded MultitrackStudio's network address is shown, you can type this address in your phone or tablet's web browser. The phone/tablet must communicate via WIFI (3G etc. is not supported). Furthermore the phone/tablet and your computer must both be connected to your home network. Note: The phone/tablet web page does not get updated automatically when you make changes using the computer mouse or keyboard. Please refresh the browser manually each time you've used the computer mouse or keyboard. The phone preset allows for controlling the transport remotely. The upper half of the screen features transport Start/Stop and Home buttons. You can walk through the history of recent transport start positions using the Back and Fwrd buttons. Tapping the position indicator takes you to a new page listing all markers. The position indicator doesn't show the current position while the transport is running, it will just show "Playing' or "Recording". 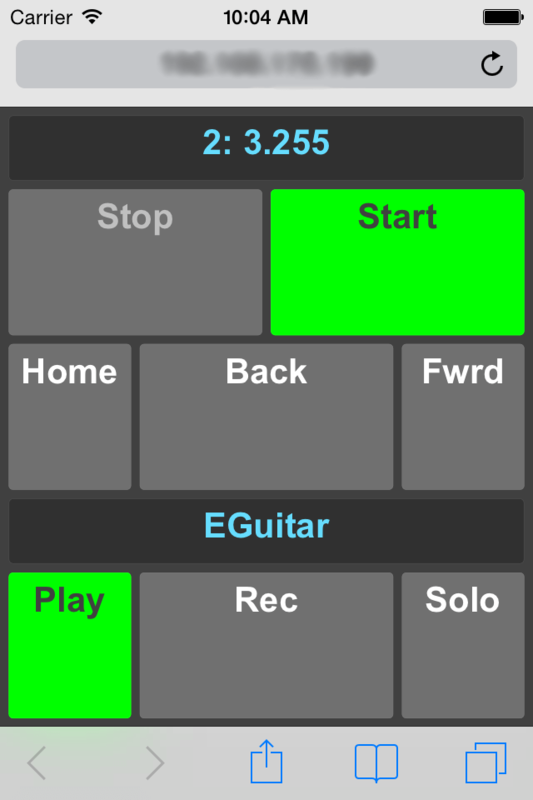 The lower half of the screen show the Play/Rec and Solo buttons of the current track. Tapping the track name box takes you to a page listing all tracks. 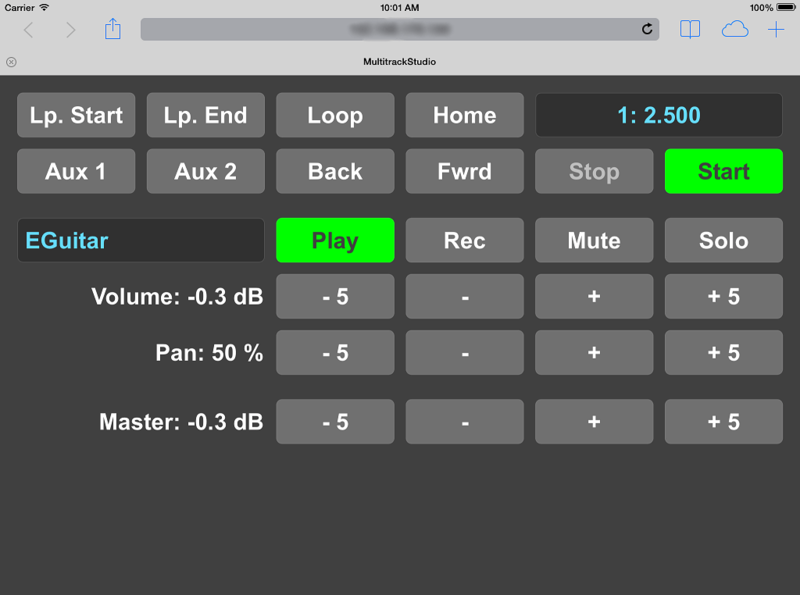 The tablet preset allows for controlling track volume and pan. The bottom row of buttons controls the master section volume fader. The Aux 1 and Aux 2 buttons can be mapped to an action of your choice using the Remote Control Settings window.